Why can I watch YouTube videos on my laptop but can't get current operational information to run my business? Streaming Analytics is made possible through specialty chips, or hardware accelerators called Field Programmable Gate Arrays (FPGAs). Here's how it works: Data enters the FPGA and passes through a series of internal "gates" according to the function loaded into the chip. Filtering and processing takes place as information flows unimpeded through the gates. The process enables algorithms to run 10-100 times faster than traditional approaches and accounts for the speed advantage of FPGAs when handling data streams. Conventional technologies typically require moving information between storage and memory to perform a processing operation. Using high-performance analytics at streaming speeds can be game-changing for data-intensive companies by improving performance by orders of magnitude. Wherever critical information is needed urgently -- fast, in-depth analysis of information impacts business performance. Financial Services firms can run complex risk analyses iteratively, hundreds of times throughout the day rather than overnight, for better trading decisions. Telecommunications companies can analyze call data records in real time to offer customers the best packages and rates. Retailers can optimize SKU-level pricing by capturing in-store data dynamically. A fundamental computer science principle says: when operating on large data sets, do not move data unless you absolutely have to. Streaming Analytics processesinformation extremely efficiently, as early in the data stream as possible. By optimizing the use of FPGAs, the architecture has revolutionized the datawarehousing industry. Data warehousing is transformed by running complex SQL queries and non-SQL algorithms used by analytics applications against terabytesof information. The ability to run a complex analysis against a huge live database, without the delays and costs of moving data to separate hardware andstoring it in an application, opens up new types of analyses previously out of reach. Want to know more about Streaming Analytics. Fill out the form below and we'll get back to you shorlty. 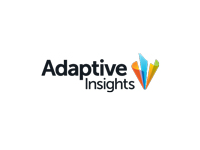 Adaptive Insights is a leading provider of on-demand budgeting, forecasting, and reporting solutions. MindStream works with Adaptive Insights to serve companies worldwide just like yours, from pre-revenue start-ups to multi-billion dollar corporations.